Ideal for use on regular and smooth-top ranges. 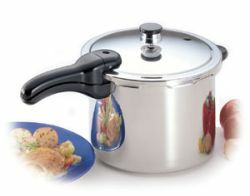 Luxurious stainless steel for long lasting beauty and easy cleaning. 6-Quart Liquid Capacity (5.7 liters).